Tahoe Truckee Outdoor: Donner Summit Bike Time Trial: Sept.8th. 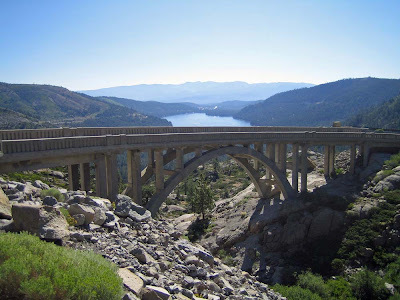 Donner Summit Bike Time Trial: Sept.8th. The Auburn Ski Club presents their annual bike time trial up old State Route 40 from Donner Lake to the summit. Come out and see how you compare to the fast guys. Times in the 14 and 15 minute vicinity have been posted by the guys. KaterinaNash, from Truckee, has set the mark at 16:45 for women. Nash placed 14 in the mountain bike cross country race this year in the Olympics. The first rider leaves at 10:00am. There will be 30 second intervals between riders. Stay to the right as you ride because the course will be open to traffic. An award will be given to the fastest man and woman. The price is $25 pre-registered and $30 on race day. 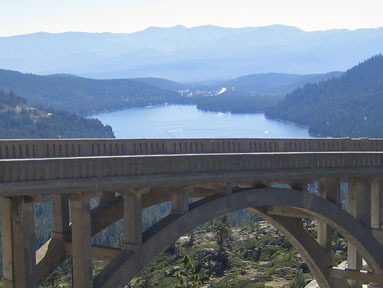 Rainbow Bridge on State Route 40.